As the good people of highsec go about enforcing the Code, they'll run across the occasional obstacle. I know this, because I'm right there with you, in the trenches, fighting the good fight. I know the challenges and glories my Agents face, because I've lived them. Today I would like to put a spotlight on a new, disturbing phenomenon among our enemies: Denialism. 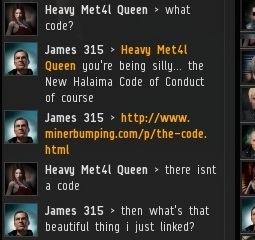 As you can see, Heavy Met4l Queen is a Code Denier. 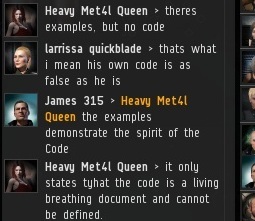 She refuses to accept the Code's existence. Of course, they'll always try to dress it up with arguments like this. Recall the article I wrote a month ago about the authority of Agents of the New Order: We know that the specifics listed in the Code are emanations of its spirit. Enumerating every possible provision of the Code would only serve to limit, not expand, the Code. The true goal of the Denier is to wipe us off the map. Fortunately, the New Order is Invincible. This means the Deniers give themselves over to fantasies like HMQ's project for a mass petition. I call it the "Forever Petition". 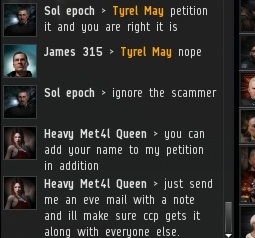 For some time now, HMQ has been gathering names for an super-petition to have CCP add an anti-bumping provision to the EULA. She believes this is the final solution to the "problem" posed by the New Order. An Anti-Code, if you will. Whenever a space lawyer threatens to file yet another useless petition, HMQ has another potential recruit. These recruits are always desperate, unhappy people. At this point, one must ask: Which is more real, the Code, or the Forever Petition? The Code changes lives, but HMQ's Forever Petition has changed nothing. It's ironic that Deniers would question the Code's existence, while simultaneously being so quick to believe in every false rumor and every piece of misinformation that comes their way. The Code is an instrument of hope. 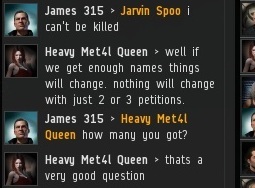 It gives people reason to believe in a better future for highsec. HMQ's Forever Petition provides our enemies with false hope. It's as simple as the difference between the truth and a lie. Which side are you on? They'll never accomplish anything. If Bumping is made illegal, we'll find other means to bring change to High-Sec. Viva La Revolution! Just dock up and don't become his content. Posts like the one above only reinforce the fact that Highsec miners have no clue about the mechanics & rules of EVE. Are you even aware of what Crimewatch is, and how it has exactly zero impact on the New Order's noble work?